I don't usually read and review books that are not widely available, but the synopsis for The Candidate by Daniel Pembrey sounded interesting. I admit, when I decided to read and review it, I did not realize that it was only available in digital format, and then only from Amazon. Regardless of that, if you are a fan of the techno-thriller or stories about corporate espionage, or just espionage in general, it is worth checking out. Nick Thorneycroft is a headhunter for a tech company who has asked him to recruit a new employee to be a top executive for the Russian arm of their business. The candidate that he selects is a beautiful woman who appears to have all of the right qualifications. But are things really what they seem to be? 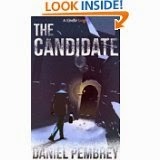 In The Candidate Daniel Pembrey crafts a fast paced story with interesting characters and some good twists and turns. I really got involved in the story quickly, and remained engaged until the end. I also enjoyed the fact that the main character for the story was a headhunter for a multi-national company, which I thought was a fresh idea that I hadn't run across in other books. The biggest problem with the story, and the reason for the 3 stars, was the lack of depth. Mostly this was due to the fact that this is a novella, which do not lend themselves to complex plot or character development. I thought, though, that this story would have stood up to, and even benefited from, more development of both the plot and the characters. I wished it was a full length novel and not a novella, and would love to see this author write something that was more complex.